Micah Gibson, manager, national tax services, PwC, led a discussion on GILTI. 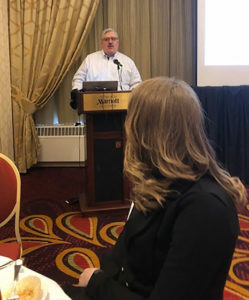 Pittsburgh Chapter president, Jim Hall, welcomed members and guests to lunch and to recognize the Chapter’s scholarship award winners. 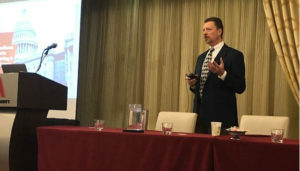 TEI’s Pittsburgh Chapter hosted its annual federal/international all-day conference on April 18. 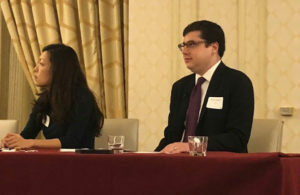 PricewaterhouseCoopers LLP (PwC) sponsored and hosted the event, which is one of the Chapter’s two annual major all-day programs and complements a SALT program offered in the fall. Attendees enjoyed a sitdown luncheon, during which the Chapter awarded scholarships to various deserving recipients. 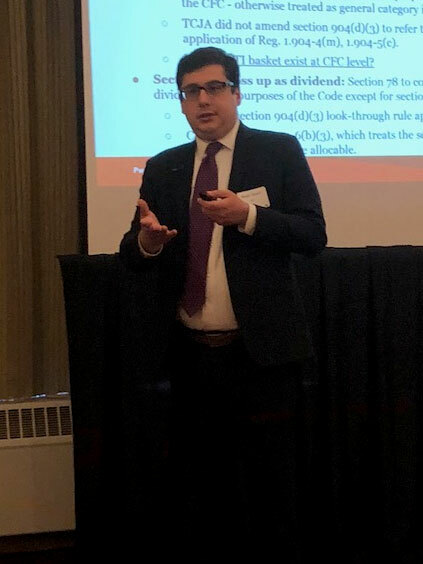 Mike Tomera, tax partner, PwC, led a discussion on the impacts of tax reform on accounting for income taxes and interim reporting. Prae Kriengwatana, international tax manager (left), and Gibson, both of PwC, led discussions on the international aspects of tax reform. This year’s scholarship recipients for the Chapter were Kara Rudzik of Duquesne University and Tylyn Bramble and Margo Gamble of Robert Morris University. The recipients already have some amazing accomplishments to their credit as well as intriguing plans for the future. Rudzik, a junior double-majoring in accounting and information systems, hopes to join a public accounting firm and specialize in risk assurance. Bramble is a junior accounting major who has set her sights on pursuing a graduate degree in data analytics. Gamble is a junior with an accounting and finance double major. She plans to obtain a master’s degree in Middle Eastern studies and will travel to Oman this summer to study Arabic.